Stella McCartney has designed Beatles-themed t-shirts for Comic Relief's Red Nose Day 2013. There are three Beatles t-shirts in the collection, each of which uses an image from their penultimate photo shoot on 9 April 1969. They are available in a range of unisex sizes for children and adults. The adult sizes are only available in short-sleeve white, while the children's versions can be bought as red or white long-sleeve, or red short sleeve. Other designs in the range feature Tommy Cooper, Marilyn Monroe, and a children's t-shirt of a giraffe. The t-shirts cost between £6.99 and 14.99, with at least £2.50 going to Comic Relief. The t-shirts are only available in the UK, via the Comic Relief website and TX Maxx stores. Buy one – it's for a good cause. 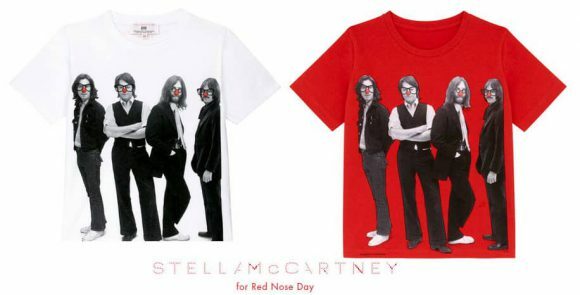 Stella McCartney previously designed t-shirts for Red Nose Day 2009, which also included a Beatles-related offering. Are there US outlets for BEATLES RED NOSE DAY T Shirts? I wanted the red nose day shirt the last time too. Come on, if it’s for a good cause, then open it up to the US market.